Recognized as the nation’s top Catholic foundation for stewardship. Enhanced communications and transparency through a mobile-friendly and accessible website. Supported God’s work through campaigns for our diocese, parishes and schools. Three of our lay Board members were honored by Pope Francis for their contributions to the Catholic faith and our Central Florida community. schools and local community needs. Supported Bishop Grady Villas, Pathways to Care, Bishop Moore Catholic High School, JMJ Pregnancy Center, and the Diocese of Orlando through event sponsorships. Responded to hurricane disasters with support for housing, food and Catholic school tuition. Together, we now joyfully await the coming of our savior, Jesus Christ. Merry Christmas! 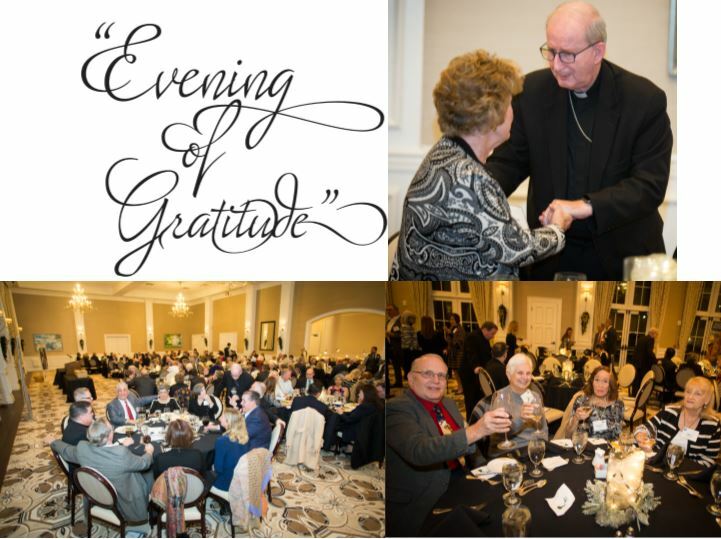 The Catholic Foundation celebrated an Evening of Gratitude in honor of benevolent Catholic leaders like you within the Diocese of Orlando. Bishop John Noonan thanked the 120 donors in attendance whose generosity transforms lives throughout Central Florida. To see event photos, please click here. Catholic Foundation Board Member, Allan Keen, was honored by Trustco Bank as a “Hometown Hero,” and provided with a $1,000 donation for the charitable organization of his choice. Allan donated the gift to The Catholic Foundation, which will be used to inspire Catholic philanthropy in our Diocese. 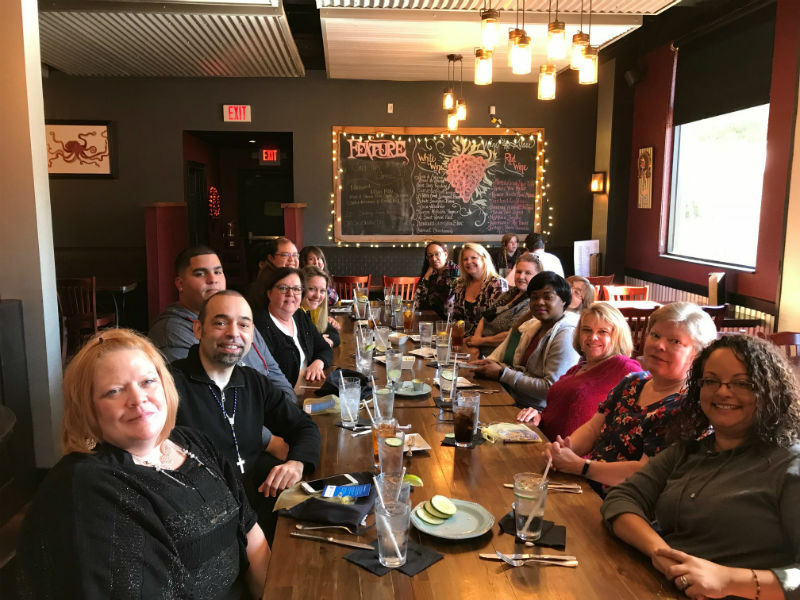 Catholic Foundation staff enjoyed a day of prayer, fellowship and fun at their annual retreat. The day began at Bishop Moore Catholic High School, followed by lunch and a fun team-building session at SAK Comedy Lab in Downtown Orlando. This Seminar is free but seating is limited. For seminar details, please click here. Did you know? 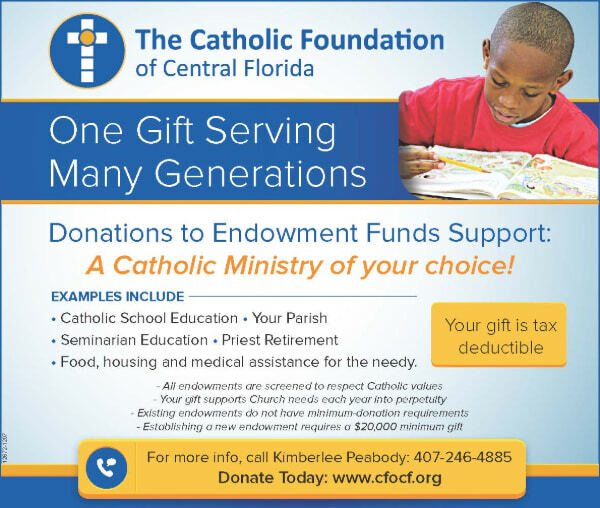 You can establish your Catholic legacy by donating any amount to existing endowments managed by The Catholic Foundation, including those that assist with Catholic school scholarships, Seminarian education or programs that assist the needy with food, medicine or shelter. Or you can establish a new endowment with a minimum gift of $20,000 to support a different cause close to your heart. Please contact Kimberlee Peabody at 407-246-4885 for more information. Please click here or on the headline above to read the article.